See our adoptable pets here! We have a wish list at amazon.com! Click here for ways you can help simply by shopping there! PLEASE CALL Linda at 856-753-9115 with any questions. DO NOT call PetsMart. Each week, viewers of WPVI-TV's (Channel 6) Action News vote on their favorite animal shelter or rescue group, which is then featured on the following Saturday morning's newscast and "FYI Philly" on Saturday night. 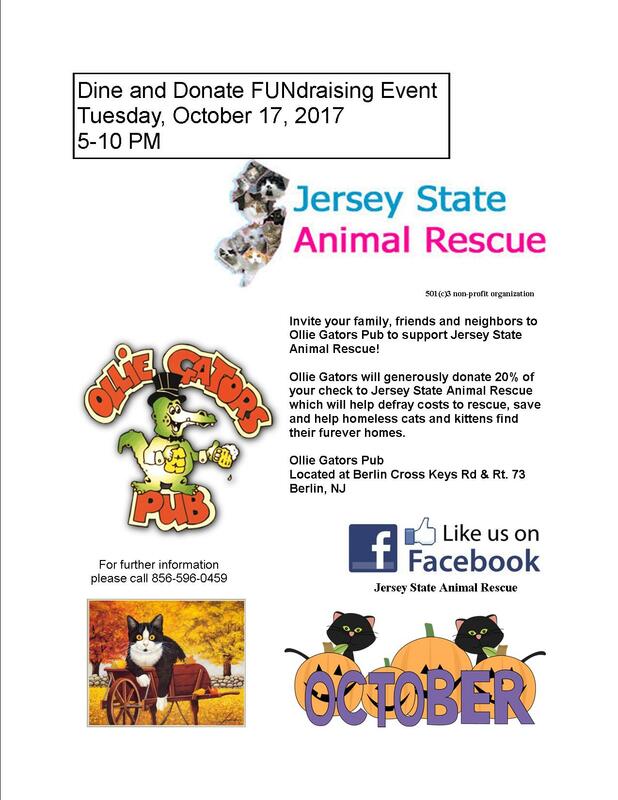 Jersey State Animal Rescue was a recent winner! Click here to watch the video! Thanks to all who voted! Jersey State Animal Rescue maintains the adoption center at PetsMart on Rt 73 in West Berlin, NJ. We need volunteers to help with this, especially on weekends. Read the information on this page to learn more about us, and if you would like to help, E-mail linchim@comcast.net or jerseystatecatshow@comcast.net for more information. Jersey State Animal Rescue is a non-profit organization comprised of a small group of people who have come together for one purpose: to help as many animals as we can. Jersey State Animal Rescue is not an animal shelter. The only space we have to house animals is a small room at the Berlin PetSmart. The rest are fostered by our volunteers who open their hearts and homes to take care of our babies. We are NOT breeders and we do NOT allow our cats to be adopted before they are spayed or neutered. Our animals are either strays, from area shelters or owner surrenders. We primarily work with cats, but do have dogs available from time to time. 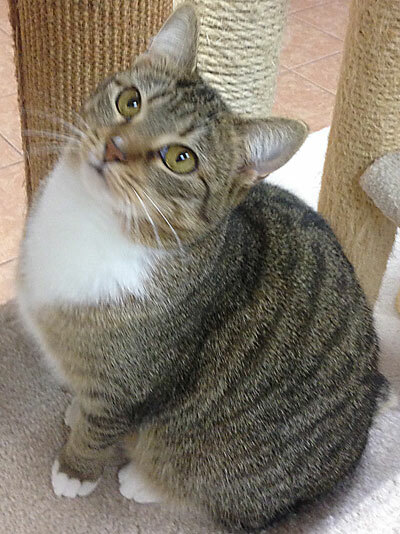 This is Sadie, Servando's sister she is a brown tabby and white about two years old. very very very sweet, loves other cats loves dogs loves people. Sadie was found in a warehouse New Jersey. She has been waiting very patiently for her own home and Family to love. 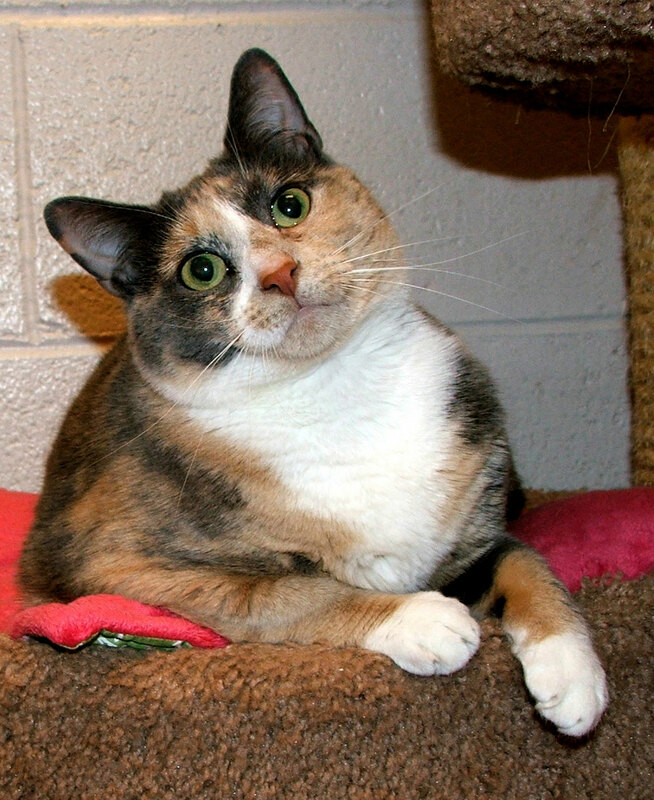 Sadie is spayed and up to date and ready for adoption. While we try to keep our online listing as up-to-date as possible, there are almost always some cats that are not yet posted. Many of our animals are at the Berlin Petsmart on Route 73. If you think one of our cats is right for you, come into Petsmart to meet them. However, for as many cats as we have at Petsmart, there are just as many in foster care. These cats are marked as such in their online description. If you are interested in a cat in foster care, please get in touch with us to arrange a visit. Our goal at Jersey State Animal Rescue is to keep our babies as safe and happy as possible. This means trying to match them with the best family possible. To this end, we ask potential adopters a lot of questions. Some people feel that the adoption process is a tedious one, but please understand that we want everyone to be happy with the new addition. In order to adopt one of our animals, you must first fill out an application. Upon approval of your personal and vet references (yes, we WILL call them) a home visit will be scheduled. This is not to invade your privacy; it is to ensure the safety of our animals and to verify your application. Please note that adoption fees are non-refundable and cash only. Please remember that volunteers run this entire organization. Most of us have full time jobs, families and animals of our own we must take care of. It may take us a few days (up to a week) to get back to you but we appreciate your patience. We hold the right to deny any application for any reason we deem appropriate. Our adoptions are not on a first come, first served basis. We try to make the best possible fit and we try to make the best decision possible for the animals and their families. If the animal you wanted is no longer available please don't give up. We always have new babies coming in and we can help you find that perfect soulmate. Are you someone who would love to own a pet, but are hesitant to adopt due to worry that your pet may outlive you? Just like humans, cats are living longer and longer these days due to the advancements in medicine and treatments. What happens to our pets after we are gone is a major concern for many of us. If this concern is stopping you from adopting, have you ever considered adopting a senior? There are many older cats who are eagerly waiting new homes, but who are not getting adopted because they are older. So, if you are hesitant to adopt a pet that may live another 15-18 years, why not adopt an older pet who may live another 5-8 years? You'll then have less concern of outliving your pet, and you won't be denying yourself all the love and joy that a pet can bring. If you are interested in any of the above, please contact us! Or you can make a donation using PayPal. Have you ever thought of opening up your heart and home to an animal temporarily? Unfortunately we are often in the position of having to turn away animals because we don't have the room for them. All we have are the few cages at Petsmart and space in the homes of kind volunteers. Do you have an extra bedroom, an office, even a laundry room? A cat doesn't need a whole lot of space, but that little space you have could save a life. A foster can last as little as a couple of days and as long as a couple of months. And, yes, it can be hard saying goodbye to them, but you get the satisfaction of knowing you saved a life, and that the animal now has a chance of finding a forever home. Some people would LOVE to own an animal but, for one reason or another, are unable to. Maybe you don't have the room to foster or the time to volunteer and really want to help. We have the solution! SPONSOR AN ANIMAL OR A CAGE! You can do this in memory of someone, in memory of an animal or just because. It costs $1.50 a day to feed each cat. Vaccines can average $45 per cat, depending on the age. Spaying and neutering is also an additional cost. And that's not even taking into consideration a cat getting sick, litter boxes, beds, grooming (yes our cats get baths and have regular grooming sessions) or just a few extra luxuries. PLEASE help us to continue our work. Contact Linda at linchim@comcast.net for more information on how you can help sponsor a cat. The cost is $20 per month and your name will be up on the cage for a month for everyone to see. Brushing your cat's coat just 5 minutes each day can greatly reduce shedding. Cats have approximately 60 to 80 million olfactory cells. The typical human only has 5 - 20 million of these cells. That is why cats have a great sense of smell. When a female cat is spayed, her uterus and ovaries are removed. Health benefits for her include the elimination of heat cycles and the prevention of uterine or ovarian cancer and mammary tumors. Feline obesity is a common problem facing cats today. Most of the time the cat simply receives too much food and too little exercise. Protect your cat by monitoring her food intake and increasing her exercise. These businesses have donated items or space to us, or they support us with donations every time you make a purchase. We feed and recommend Life's Abundance pet foods. Click the banner above to read more about Life's Abundance or to have an order shipped right to your door! When you purchase Life's Abundance from our web site, Life's Abundance donates money to Jersey State Animal Rescue. You are not only helping your own cats by feeding them quality food, you are helping our rescue continue its mission. Payment for all pet sitting services goes directly to Jersey State Animal Rescue. *Please note that the above E-mail address is monitored by a volunteer who can help you with adoptions, but NOT surrendering cats.